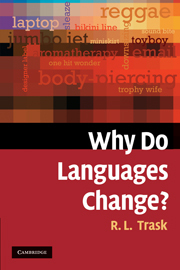 1 How do languages change? 2 Why are languages always changing? 3 Where do words come from? 4 Skunk-Leek – my kind of town: what’s in a name? 5 Where does English come from? 6 Why is American English different from British English? 7 Why is English spelling so eccentric? 8 Which is the oldest language?